A great movement is that not only good for your health, but can also help save money and assist in reducing our carbon footprint. This idea began during World War 1. President Woodrow Wilson issued a proclamation that every Tuesday be a meatless day, and another meatless meal observed every day so there was a total of nine meatless meals every week. The US Food Administration encouraged families to reduce consumption of key staples to help the war effort. In 2003, Meatless Monday was restarted as a public health awareness program, endorsed by the Center for a Livable Future. Health-wise, how can going meatless one day a week help? Going meatless for a day encourages higher consumption of fruits, vegetables, whole grains and alternative protein sources (such as beans and legumes). All which have been proven to help protect against heart disease, lower cancer risks, reduce risk of diabetes, and help you live longer and stronger. Additionally, plant based diets are rich in fiber, something that we do not see in animal products. Fiber can help you stay full for a longer time, and lessen the chance of overeating at your next meal, lowering your daily calorie intake. Meatless meals added to your weekly menu are based around fruits, vegetables, beans and grains. These are much less expensive than meats. – Approximately 1,850 gallons of water are needed to produce a single pound of beef. – Approximately 39 gallons of water are needed to produce a pound of vegetables. 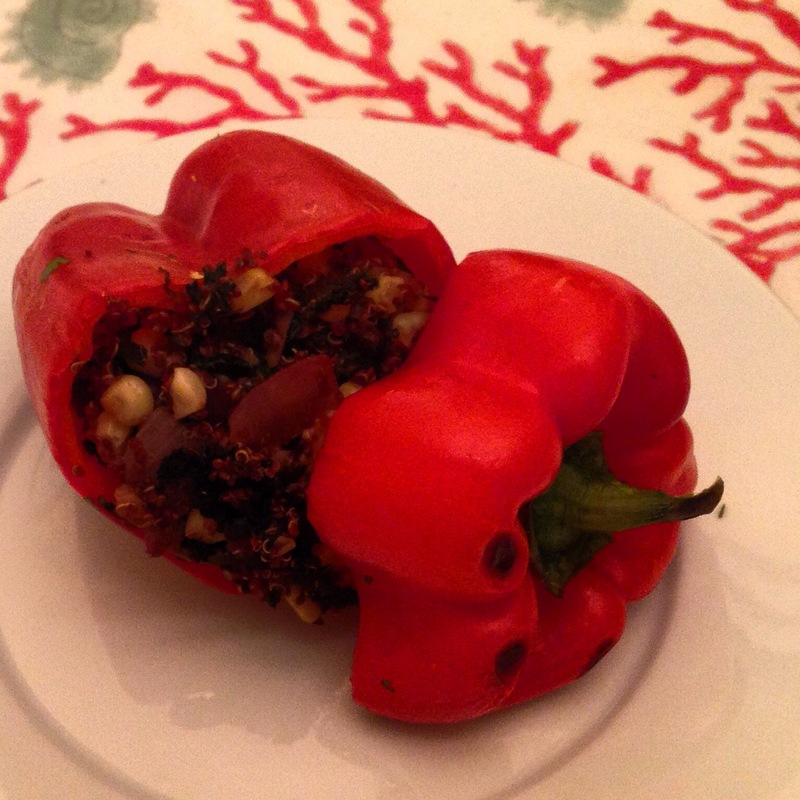 So, in honor of Meatless Monday, I created a new stuffed bell pepper recipe. In a large pan sauté: red onion in olive oil and crushed garlic. When red onions are transparent, add black beans, corn, cilantro, cumin, salt and pepper. Stir well and continue to heat for ~3 minutes. When quinoa is cooked, squeeze one lime in quinoa and stir. 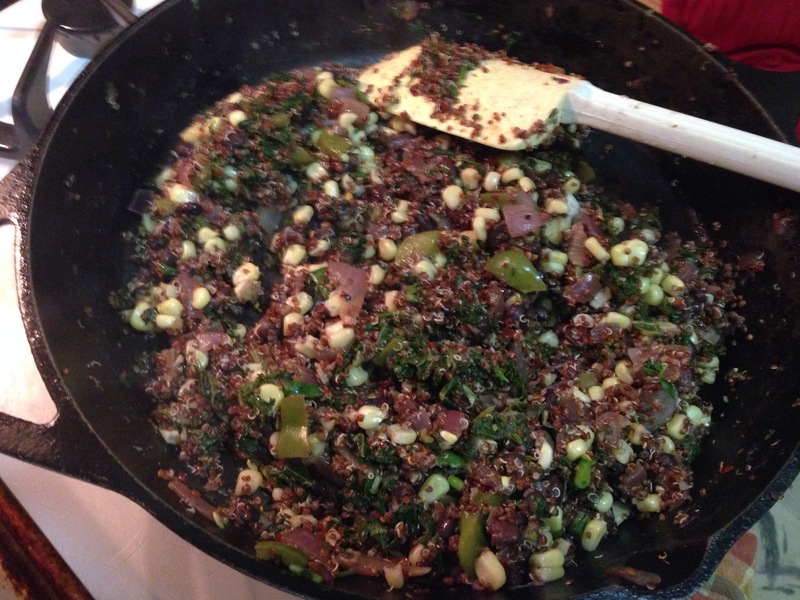 Add quinoa to bean, corn, quinoa mixture and stir. Place bell peppers on a cookie sheet. Scoop mixture into the bell peppers. 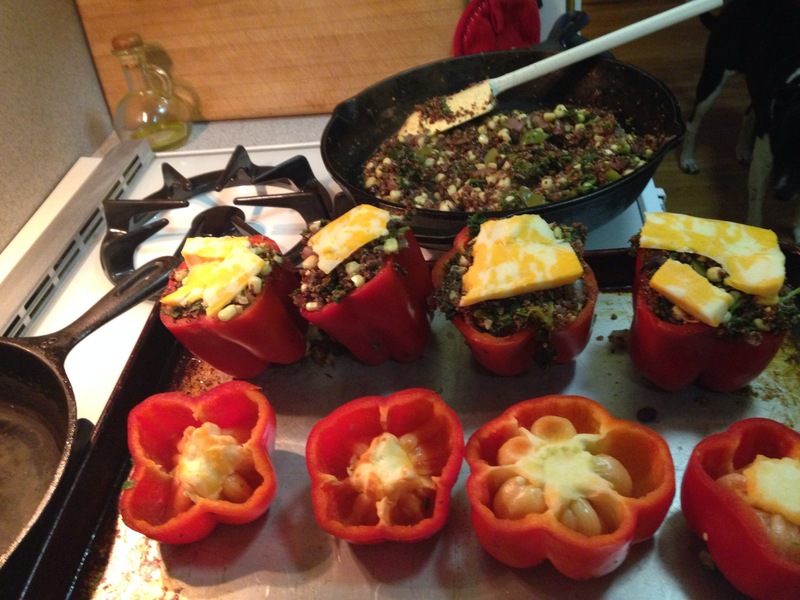 Place in pre-heated oven and cook for ~10 minutes, until the bell pepper is soft. Wonderful idea for the stuffing! 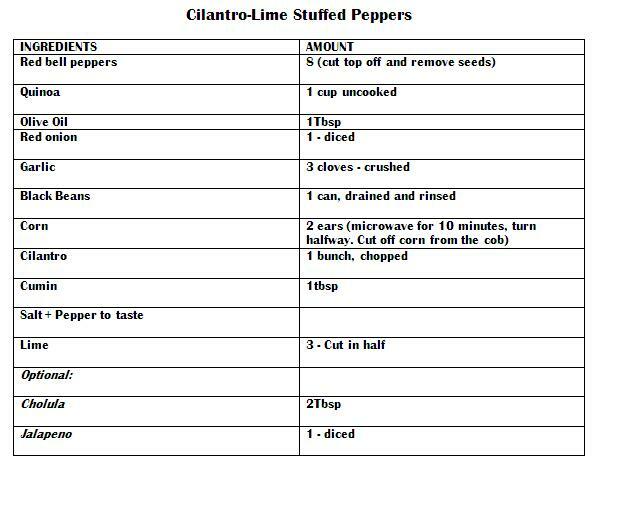 I’ve always wanted to try a stuffed pepper! They always look good.